"It must be acknowledged that the term 'republic' is of very vague application in every language..."
On July Fourth, an essay by Nicole Swinford titled 10 Things You Might Not Know About America’s Independence that appeared on the Fox News Web site was regurgitated in full or in part on dozens of right-wing blogs, including one I commented on in a previous post. This essay is almost certain to become one of those annoying endlessly forwarded e-mails decorated with irritating gifs of flying hummingbirds and flapping flags that will be sent around next Independence Day and every one thereafter. One should always beware of what America’s right-wing amateur historians of the revolution claim Thomas Jefferson said. 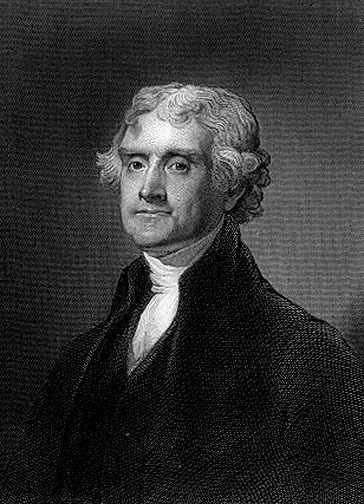 Many times, when you’re given a Jefferson “quote” from one of these sources, though it’s always intended to back up their faith that the Founders were exactly in line with their own political beliefs, you can almost certainly guarantee that Jefferson meant the opposite of what they claim he meant. Our Founding Fathers deemed this an important distinction to make and discussed the matter quite a bit. In the end, our Founding Fathers claimed that a democracy was both extreme and dangerous for a country as it would most assuredly result in the oppression of the minority by the majority. Take this one example from Founding Father, Elbridge Gerry: “The evils we experience flow from the excess of democracy.” And Thomas Jefferson said that democracy should never be practiced outside the limits of a town.